Monday Lunchtime Sketch Challenge 124! Top Three for sketch 123! Monday Lunchtime Sketch Challenge 123! A couple of cards for a couple of challenges! 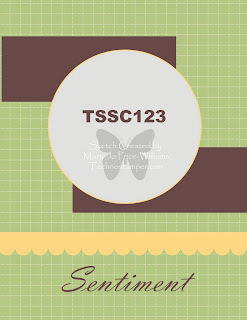 Technostamper Best of the Best for sketch 120! Monday Lunchtime Sketch Challenge 120! Wow, the week's just go faster and faster. I hope you have been enjoying your holiday weekend. I am so happy that tomorrow is yet another day of no school. I am so ready for my son to be home with me for a while. They have 16 more days left till summer vacation. Let the count down begin! I hope that you found a moment over the last few days (or tomorrow, or any day) to think about the people who gave the ultimate price for OUR freedoms! I find it incredible the courage these men and women have. I pray that the troops that are continuing their efforts make it home safe and soon! Hard to imagine what they are dealing with over there as we sit here and blog surf or what have you. This is one of those five minute cards. I love that. I had the sketch and the colors so it just went one two three. Of course I kept it CAS (Clean and Simple) which I am really liking lately. Don't forget to add your direct link below! Can't wait to see you creations, I know they will be beautiful! I am excited to show my top three for last week's sketch. I hope you will take a moment to visit their blogs by clicking on the preview pictures. Let them know how awesome and talented they are. (all of you who played along did a fabulous job with this sketch.) Thanks so much to everyone who played along. Here are my top three picks. Please feel free to add my badge to your blog if you would like. Congratulations. If you are a US demo why not come on over and play?! Click here to be brought to the demo only forum. 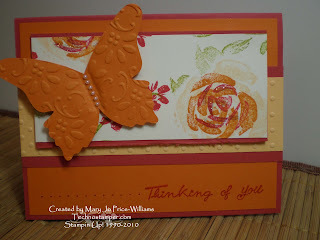 The whole idea of this challenge is to be inspired by a card in the featured stamper's gallery. This week we are honoring Wendy Janson. 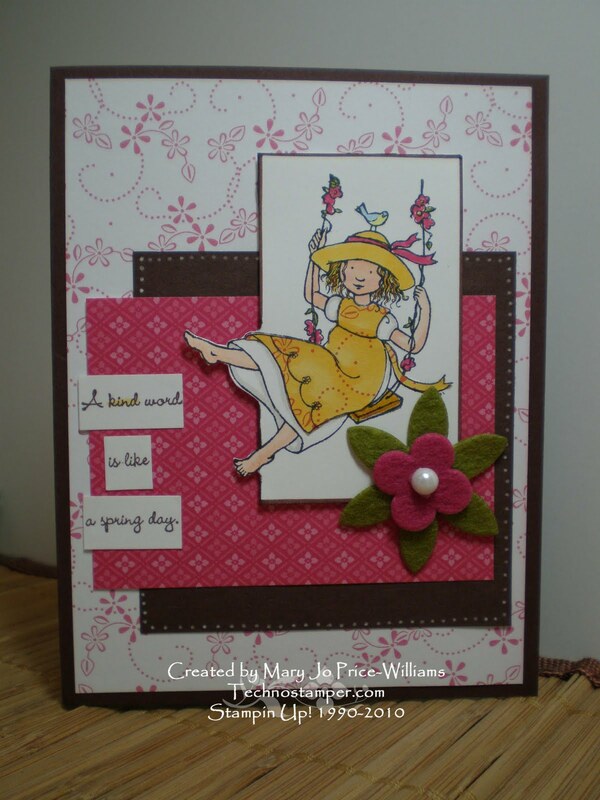 Here is her card that inspired me. Hope you have a fabulous Sunday! Be a blessing to someone today, it will bless you too! 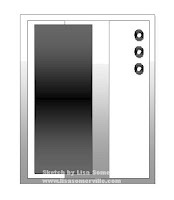 Lisa is always so good at being right on with the themes for our Blogger's Challenges. This week we are doing Red White and Blue. 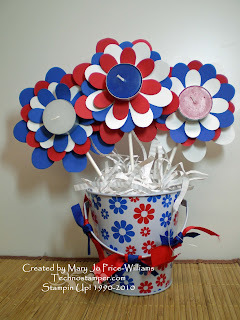 I had lots of fun making this fun flower pot with candles. 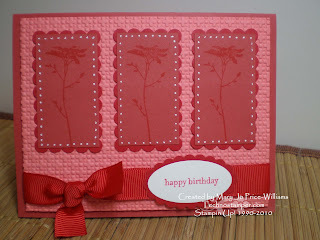 And the card is just using up more of those pre-cut scraps I have laying around. I do not intend to burn like this so don't worry, lol! I found this tin in the dollar spot at Target. 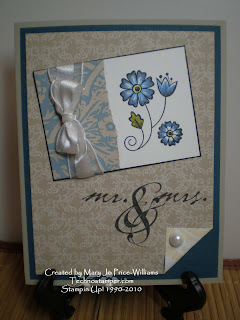 So cute, matches with the flowers from the flower folds die so nicely, don't you think? I am so glad I finally got this die. I have been making so many things with it. At mommy and me we made flip flops, barrettes, hair bands, pins and baseball caps with it! I will take pictures of the stuff when I finally get it all unpacked. Now for the fast and simple card. Be sure to click on the logo on my sidebar to see what the rest of the talented ladies in the group are doing for their red white and blue challenge! I sure it will be fabulous. 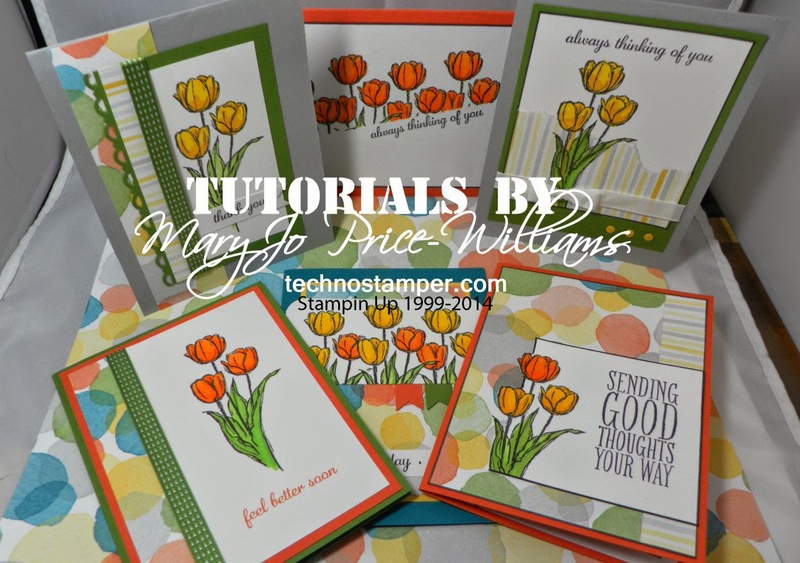 I don't know about you but I have tons and tons and tons and tons of scraps laying around. And since I do classes I have lots of left over pieces for different card kits too. So I have been trying to purge some of this--I am re-organizing my scraps to make better use and thought what the heck might as well make a few cards with these weird pieces. 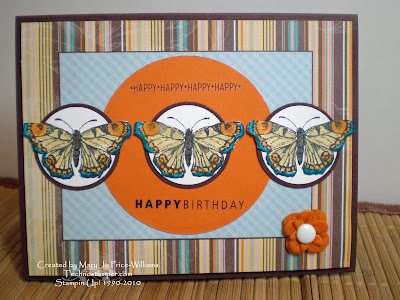 The theme for the weekly challenge on Latenightstampers is Masculine and the ED11 challenge on Latenightstampers is to use brads and/or eyelets, so this is what I came up with combining all of the above! Most of the pieces for this card were from an old Christmas card from about three or more years ago. Creamy Carmel will not be around much longer so had to use it! I still have tons of it left! Maybe a little too fancy for a guy, but maybe not??? 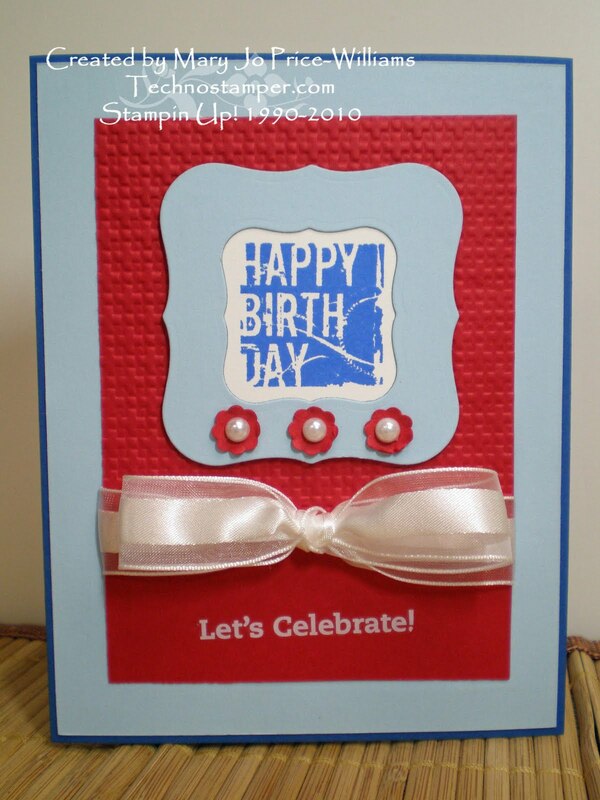 This next card is made with scraps that were cut in a strange shape so I tried to make it work. I know it is a bit of a weird color combo for the theme but I kind of like it. That is it for now. I know they are a bit different than my norm but sometimes you just got to play around. Yep, I am in charge off this too, lol! I am sure you will see quite a few things on here in the next weeks that are made for this. My first share is these fun bookmarks I made for staff. In an effort to have the kids become involved--just a bit--with the luncheon, I wanted to do a sort of Staff Grammies Award. I will be sending home voting ballets to the kids to vote on the choices for the following catagories. Staff Member with the most school spirit! 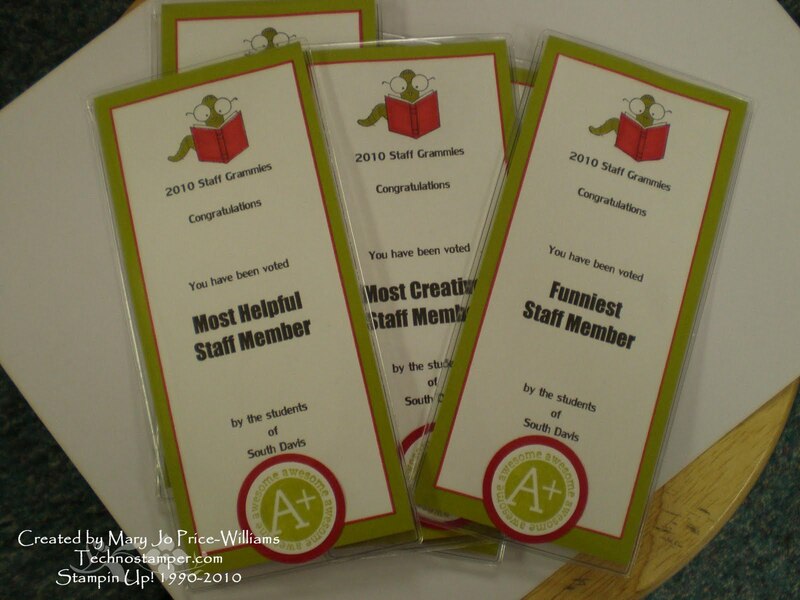 I will be making the announcements of the winners during the lunch and they will receive the following for the "prize"
The bookmarks are pretty big, 3 by 7 -- I think they turned out just adorable. 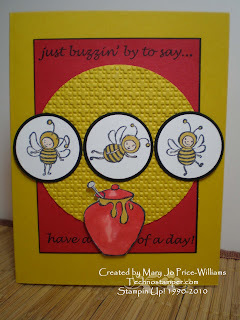 And oh so easy with our new First Day stamp set and the My Digital Studio Software! Love it. and remember that it is a choice to be happy and WE are the only ones in control of our emotions. No one else can make us miserable, unhappy, mad, upset, or even happy if we do not choose to let them! Welcome to a brand new week! I for one am hoping that this week goes better than the last two--so here's to a week full of blessings and fun! My fingers are now Not Quite Navy since I died the ribbon without gloves, hint, don't try this at home, I am a professional! HaHa, I will be looking like this for a few days since it is so hard to get off, anyone have any quick fixes??? Don't forget to add you link below when you are done with you card. Can't wait to see what everyone comes up with for this one! Some great samples again this week. Below are peaks at my top three choices for the week. Please take a moment to view the full cards, they are beautiful. You can click on the pictures to be taken to the creators blog, while you are there be sure to tell them what a great job they did! Thanks to everyone who played along! Congratulations to the winners! You can add my badge to you blogs if you wish. Don't go too far, I will be right back with the sketch for this week! 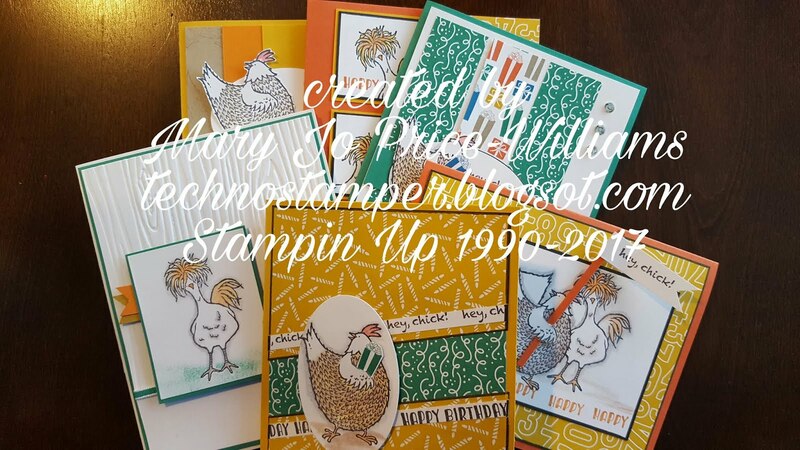 Today on Stampin Connections we are honoring Barb Mulikin. 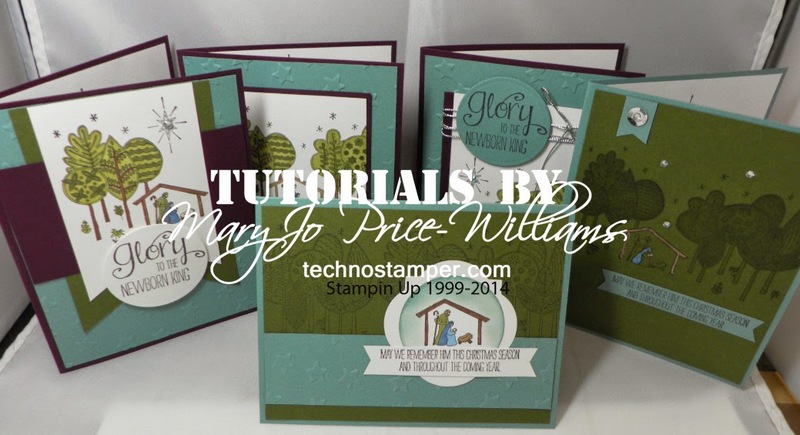 Barb is one of my favorite stampers, I haven't been following her in a bit do to lack of time and not really following anyone but I was pleasantly surprised as I knew I would be when I looked around her gallery and blog. 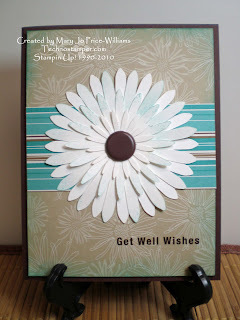 I chose this project for my inspiration for the week. 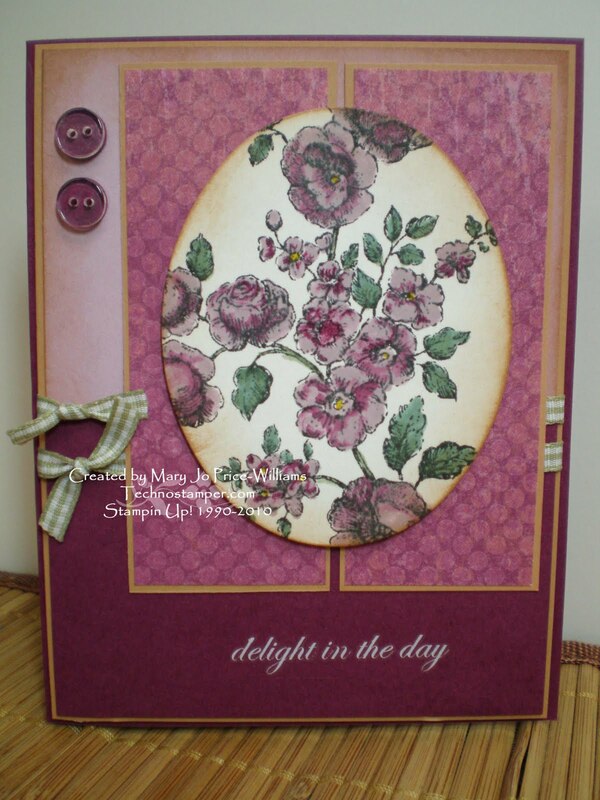 I was trying to use up the retiring Pink Passion Paper. 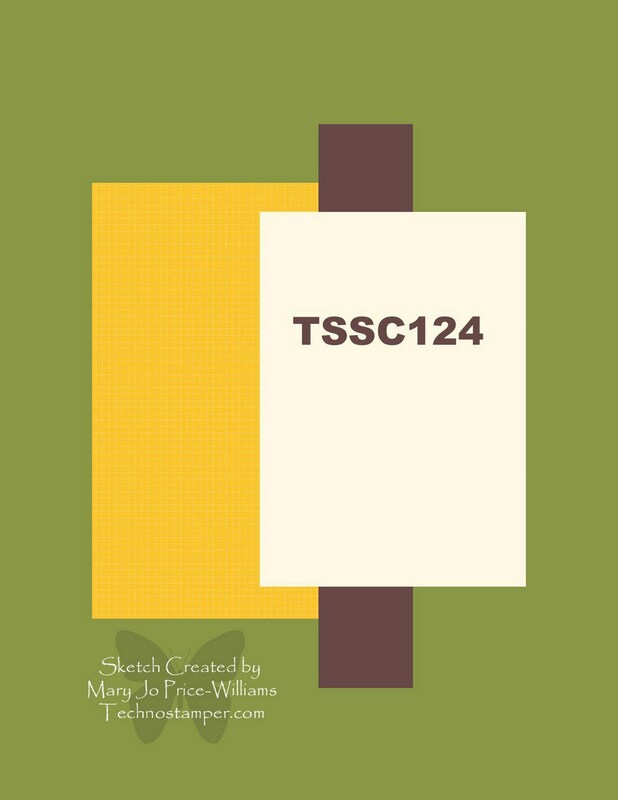 the folio is made from one piece of 12 by 12. There are 8 note cards and envelops inside with a pad and matching pen. 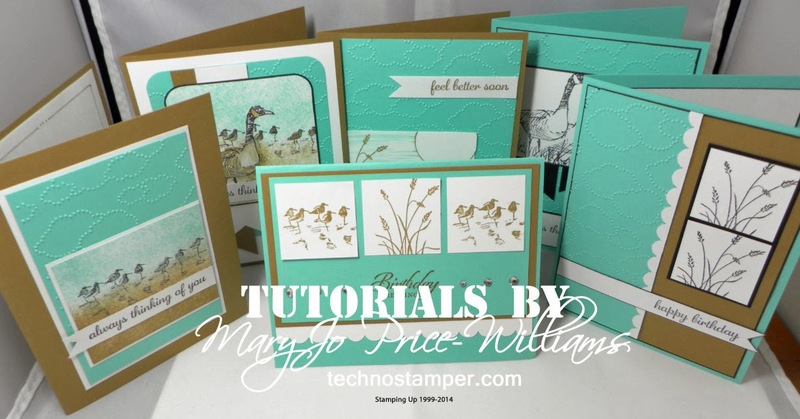 Hope you have a fabulous day, be back later with my Technostamper Sketch Challenge for the week. 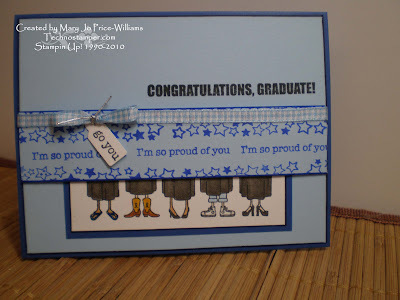 I am sorry that I am not feeling up to adding all the details right now, I really just want to go do some stamping and crafting with my son. If you have questions please ask, it is pretty basic though. The colors are Ruby Red, Pumpkin Pie, Apricot Appeal, Very Vanilla. 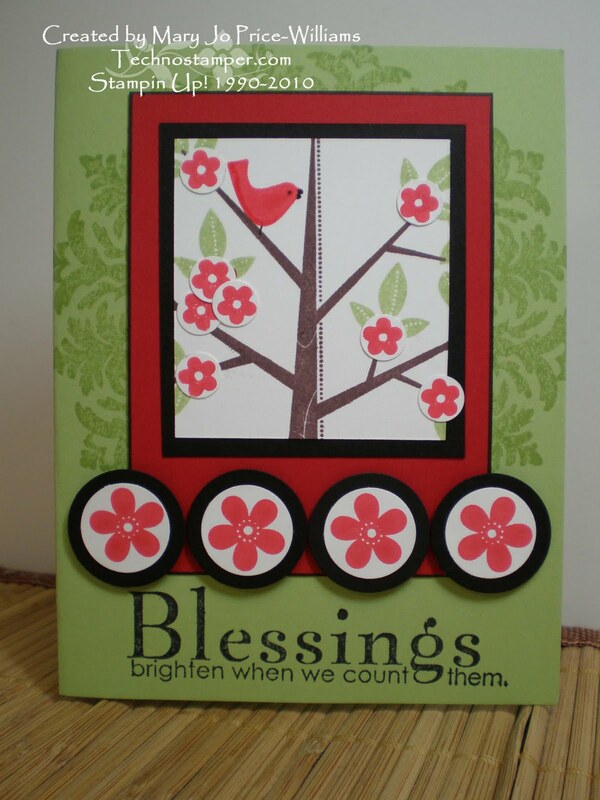 Hope you day is filled with many blessing! In an effort to get ready for the new color renovation I have been digging though tons and tons of scraps and old card kits from old classes. 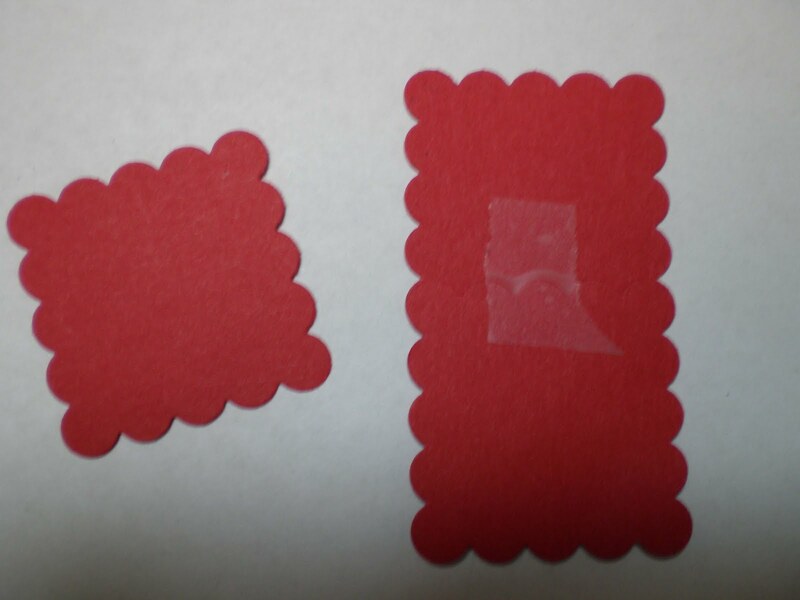 These papers were from a Christmas Card class I did two years ago, lol. Hence my color combo, but I really am pretty happy with how it turned out. Fun sketch, I am thrill with the results you guys came up with. Below are my top three picks. 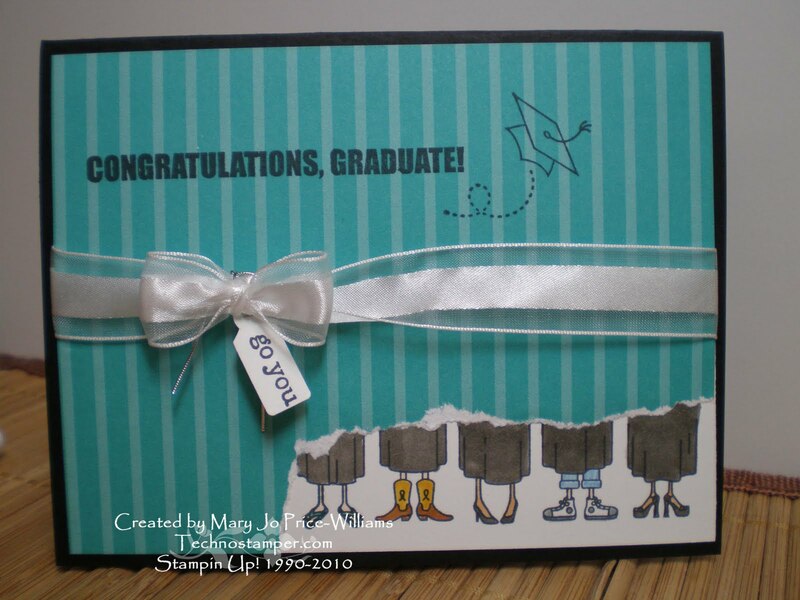 Please take a moment to click on each image to see the full card and congratulate the creator. Thanks to all of you who played along and congratulations to the three top picks. 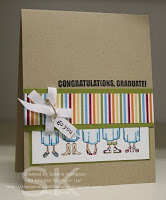 You may add the award from my sidebar on your blogs! 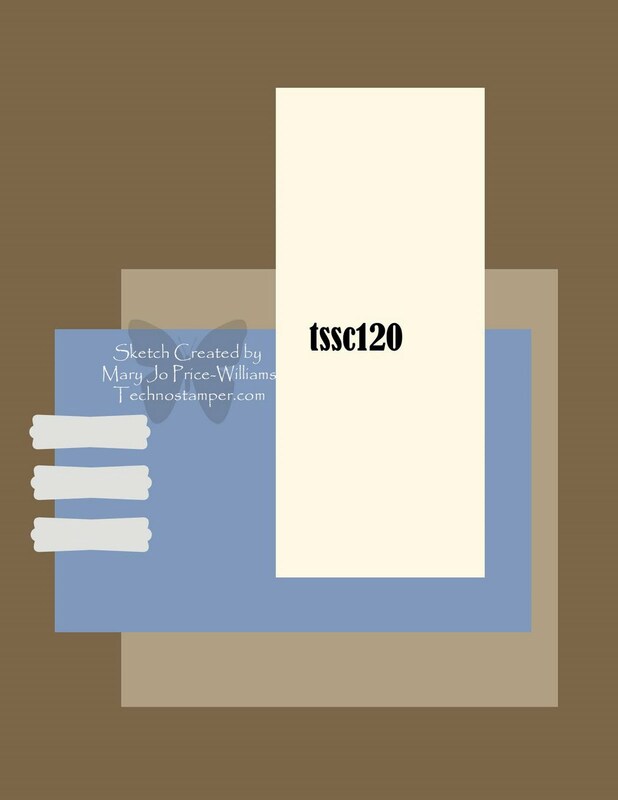 Here is Selene's I love the contrasting colors but I needed to use these black and blue colors. Hope you have a great day! I am off to get ready for church, be back later with the new sketch challenge for the week! The first is the sketch challenge number 16 on Stampin Connection, second the CAS challenge on Stampin Connection which is to use a summer theme, and last but not least the Latenightstamper's Challenge to use new stamps from the current mini catalog. 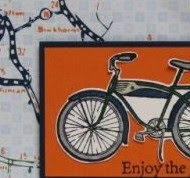 Hope you are off to a fabulous start to the weekend! Looking forward to some sun here, getting a little tired of clouds and rain! Both challenges are mine! 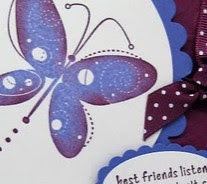 The first butterfly card is another sample for my Monday Lunchtime Sketch Challenge 121 it also fits the Latenightstamper's weekly challenge to use stamps from the current mini catalog. 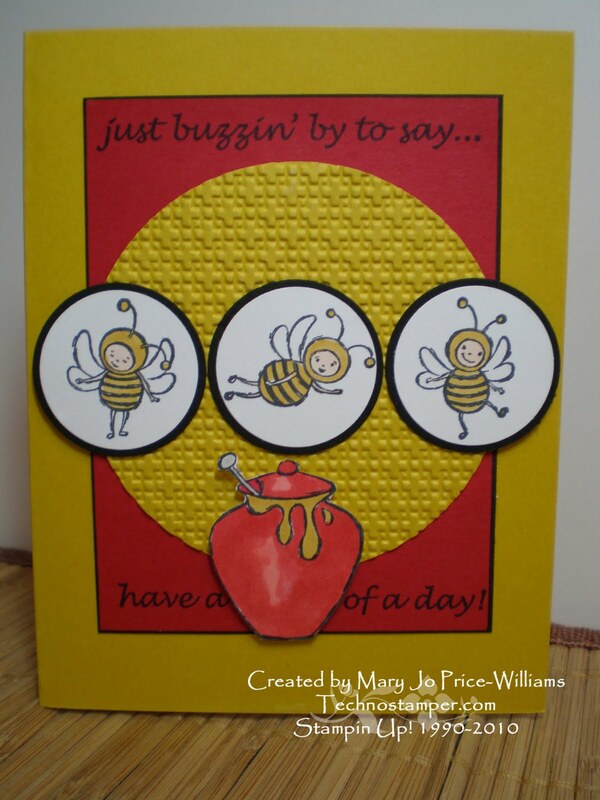 The second card is for the ED9 challenge -again on Latenightstampers -to sponge on an Easy and Demonstratable card. Don't really like this one but that happens ever now and then. I am still sharing it because it seems the ones I don't like others really like! Imagine that. 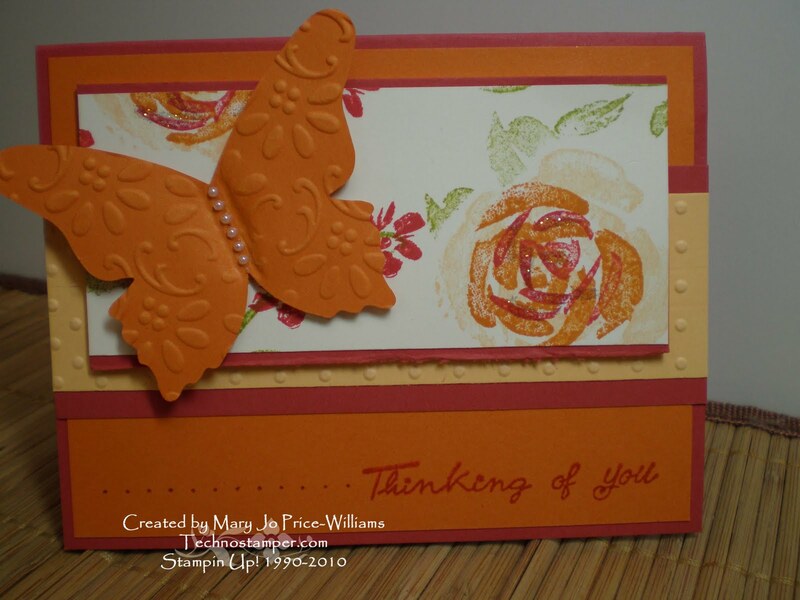 This week's challenge on Latenightstampers is to create cards using sets and supplies form the new mini catalog. This was my first sample for the week. 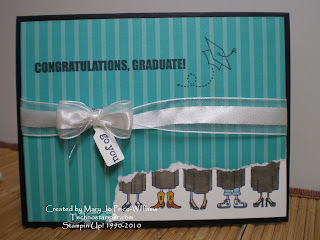 We did this card in my all occasions class--one like this and one in pinks. I thought it was fun to tear the paper on the side and show the feet. Hope you have a great day, I will be back later with this week's ED challenge! 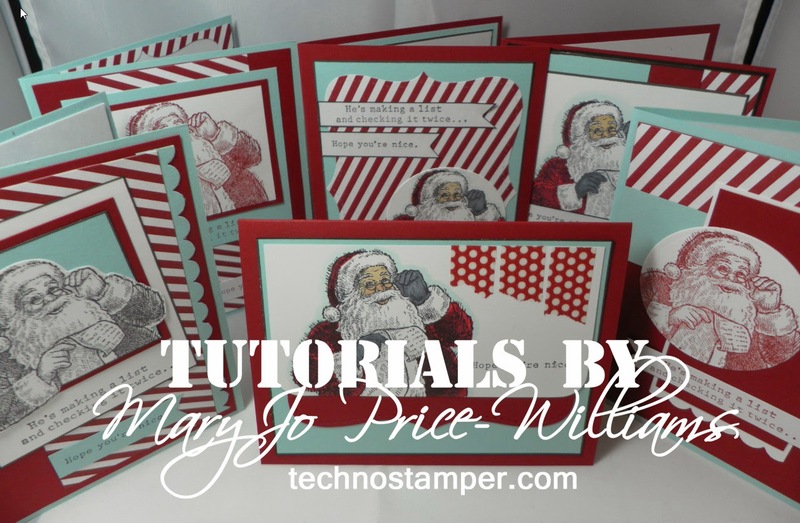 Easy and Demonstratable Cards. Technostamper Monday Lunchtime Sketch Challenge 121! Thanks for stopping by today. I have a really fun sketch for you this week. I can not wait to see what you come up with for it. Don't forget to check out the top three from last week on the previous post. 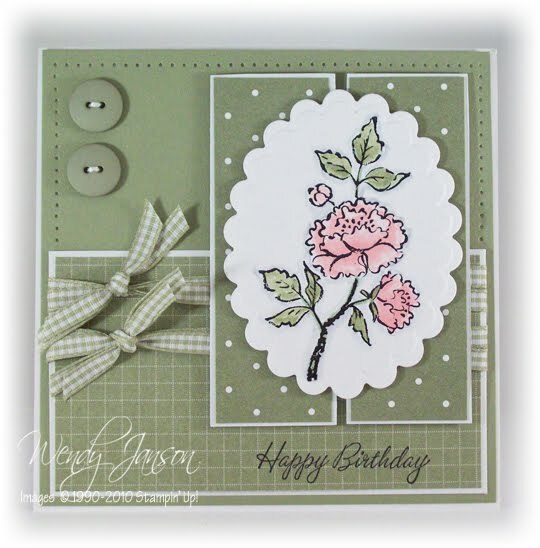 And here is my first card with this sketch. I changed the squares to circles and moved the bottom element over a bit. I am surprised that Crushed Curry did not make the cut for the new colors. Such a fun color. I matched it up with black and red for this fun card. Other: markers, circle scissors plus, embossing folder, circle punches. I hope you find time to play along this week. You can add you sample below. Here are my top three pick for last week's challenge. Click on the photos to see the original post on the creator's blog. Tell them I sent you and let them know how awesome their cards are! What fabulous samples this week--again. I really enjoyed this sketch, hope you did too. Be right back with the new challenge sketch! 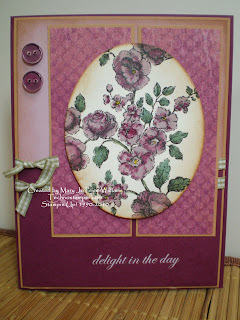 This week on Stampin Connection we are featuring Debbie Cipolla one of our fellow demonstrators. 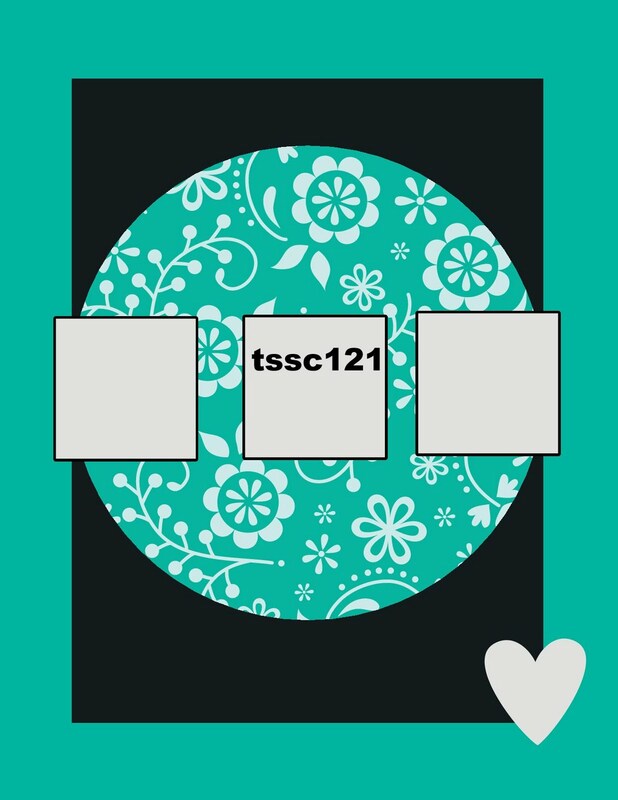 The idea of these challenges are that you pick a card she made and re-make it changing at least two things. I did two this week. These will be part of my all occasions class this month. 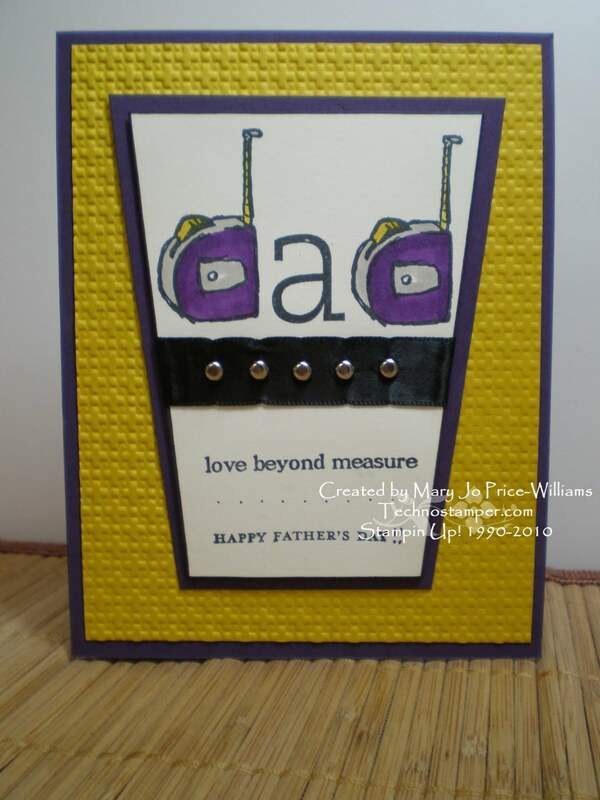 This first card is using two of my favorite colors that will be retiring. Cameo Coral and Ruby Red. I also added some Real Red that will not be retiring. 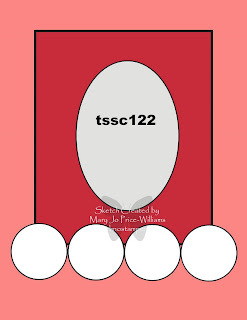 The scallop rectangles are done by taping two scallop squares together. You can see the card I chose to inspire me on the right. 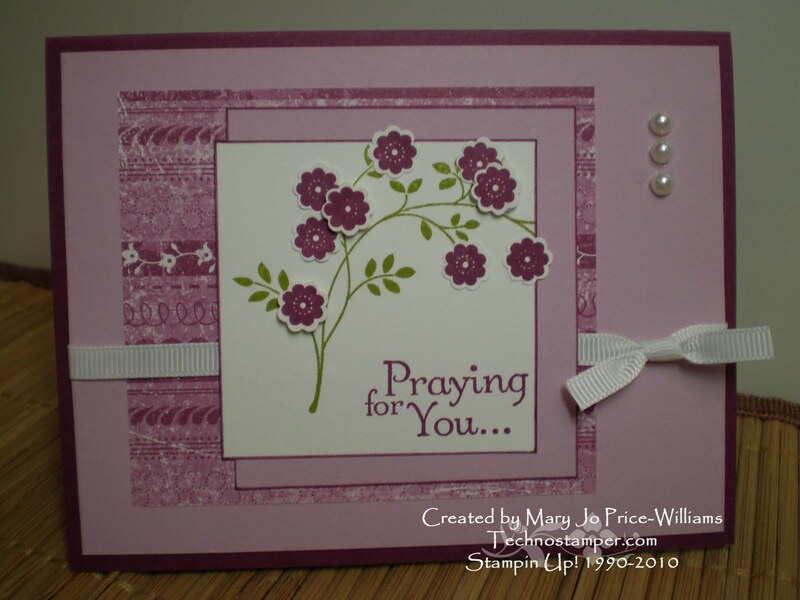 I changed the size, color, added scallops and texture, changed the position of the ribbon and sentiment, changed the stampers and added the dots. The next card is a combo of inspiration taken from the same card above and another card too. 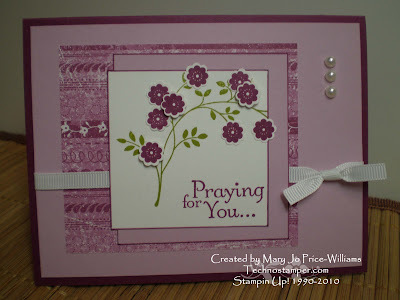 I loved the colors on the card above and the layout of this new card. Very simple yet so pretty. I changed a lot on this one. But I did basically keep the layout the same. 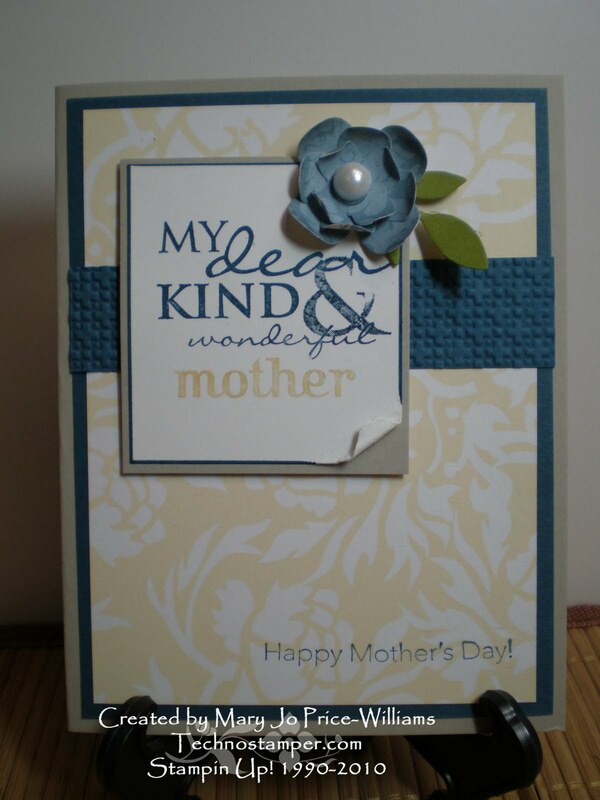 I sure hope that you all have a wonderful Mother's Day today! I am also sharing a poem that was posted on one of my boards today that I really likes. Hope you enjoy. I hope your day is blessed with much love and some time to spend on YOU! You are special and deserve to be praised today! I am so thankful for good teachers. I get nervous when I start to think about all the budget cuts coming and what we may loose. My son is special ed and may loose aids and other stuff with all the cuts--especially if people vote down the new budget. So will all that I thought I would make a gift for my son's teachers. I have to make a few more but I think they turned out adorable. We did these in club this month. It uses the new First Day stamp set from the new Summer Mini. 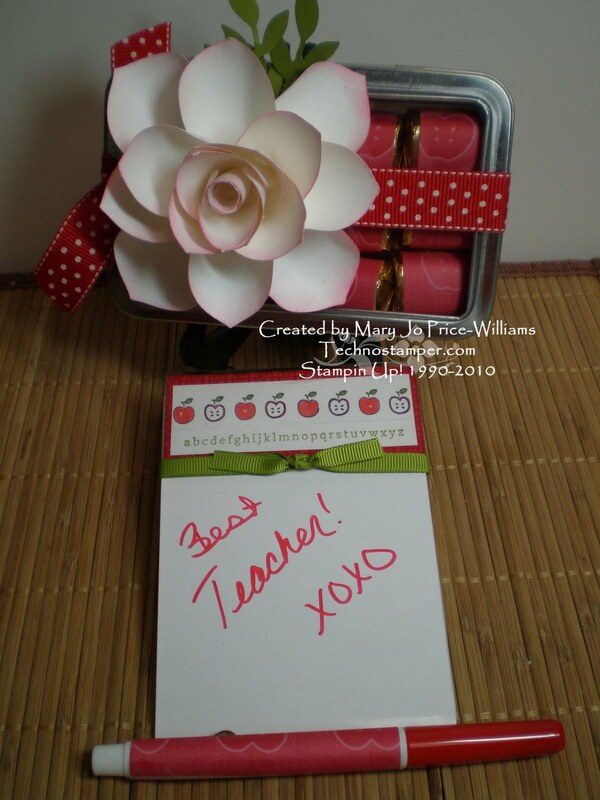 It is a dry erase easel with matching pen and a tin with candy and the ornament punch rose. This was so fast and easy to make. The erase board is actually one of those plastic picture frames turned on it side. The top part is inserted inside the frame and then I added sticky dry erase sheets to the front. I used some retired paper to make the pen match. 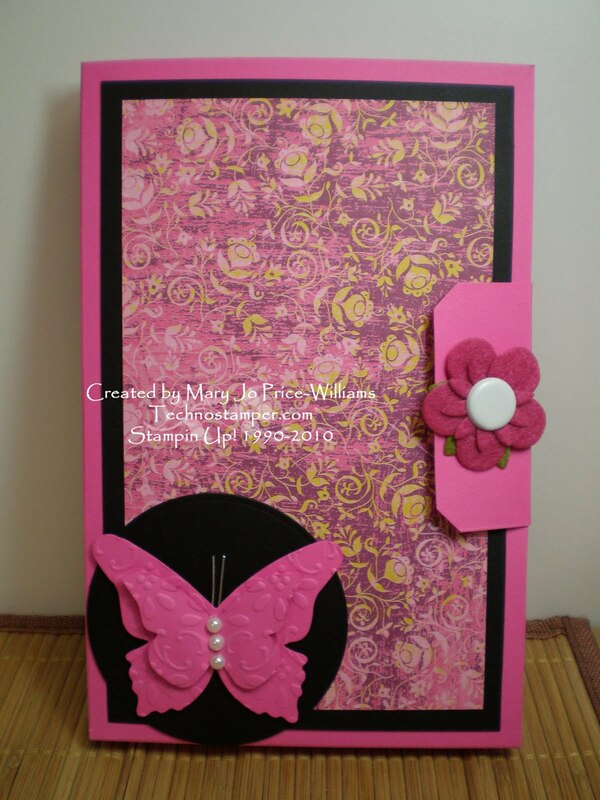 Fun and easy project. I got the directions for the rose HERE . See ya bright and early in the morning. 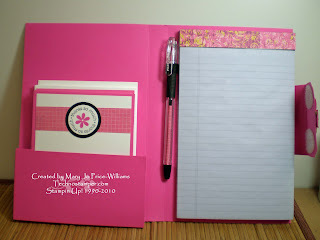 Geez, it took me all day to get this post up, blogger was being difficult. Looks like it has decided to behave at least for now. This week we are focusing on Mothers! Appropriately so! I took one of my favorite word stamps from the All Holidays set and added it to another sentiment stamp in the same set to come up with the appropriate sentiment for my mom. 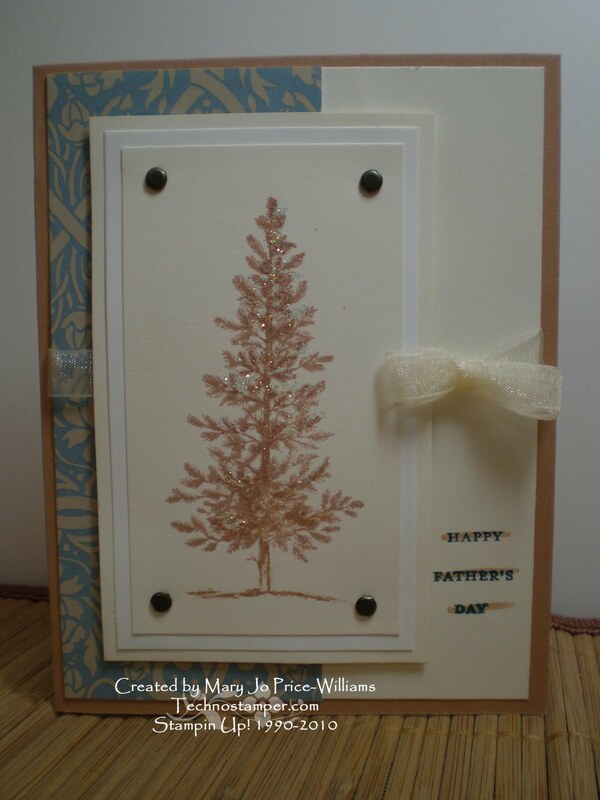 It is actually a simple card but I like it. I combined it with the Latenightstamper's Challenge 69 to use pearls and swirls. 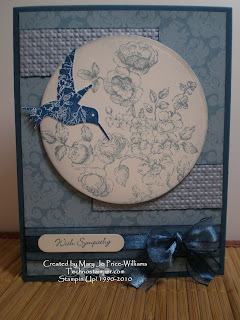 I love this Bella Blue paper. So easy to get beautiful cards with it. Other: embossing folder, sizzix sizzlets, markers, pearl from the pretties kit. I have not yet had the chance to announce here that I am now the proud co-owner of the Latenightstampers group. You all know how much I love this group and I would love for you to join too! 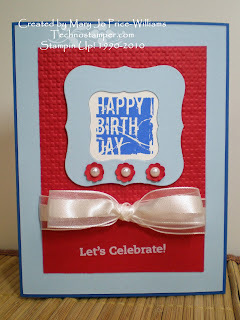 You do not have to be a demonstrator just have to love Stampin Up! 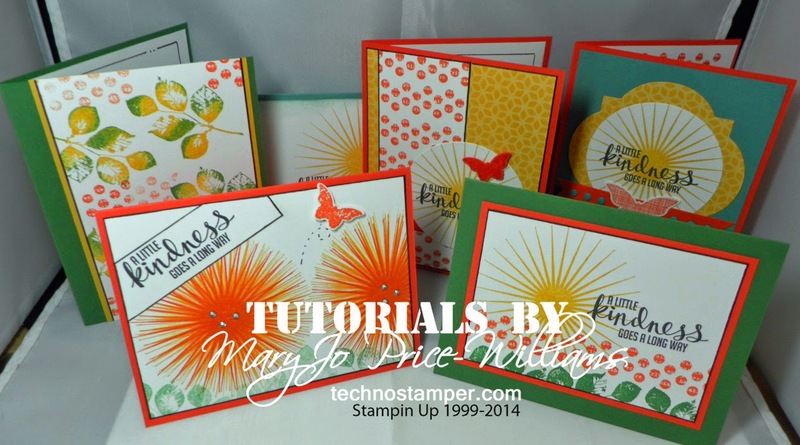 It is all Stampin Up! ALL THE TIME! If you are not already a member please join below. 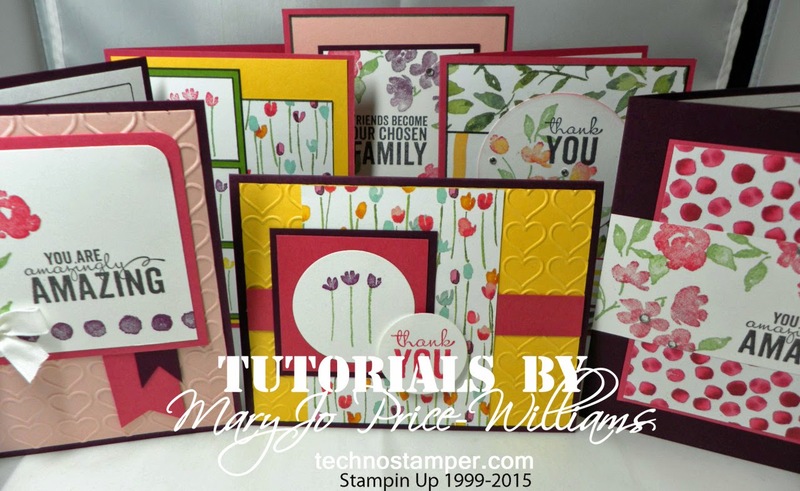 It is free, fun and has tons of samples shared everyday with all Stampin Up! products. Here is this week's ED8 challenge. Welcome to week number 8 of the Ed challenges. 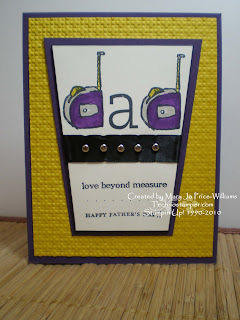 Ed stands for easy and demonstratable cards. You have a choice this week of two different themes. You can create a wedding card or you can create a project/card with buttons, or you can even combine the two! Your choice. I hope to see lots of samples in the photo album. You can upload your sample and see the other samples HERE. Have a fabulous day! See you on Latenightstampers! Thank you for stopping by for the new sketch challenge. I hope you will play along. Don't forget to leave a link at the end of this post. If you haven't noticed I change the re-cap this week again. 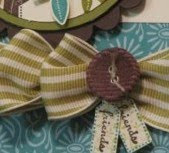 I posted a sneak peek of my three favorites with pictures that link back to the creator's blogs. I hope you will visit them and let them know how much we enjoy their work. 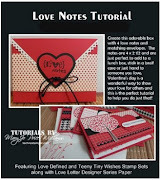 Also leave me a comment letting me know what your opinion is of this new method. Now on to this week's sketch. I really like this one and think I will be using it some more this week. And here is my sample. I combined it with the new challenge for the week on Latenightstampers. 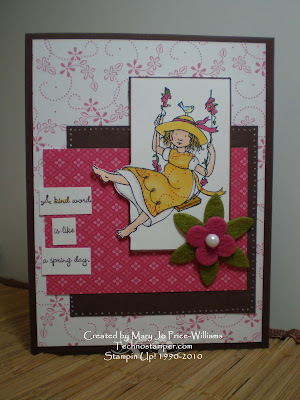 This week we are making projects with swirls and pearls! I love this adorable set! This is actually the first time I have used this stamp from the set. Not sure why, it really is darling. 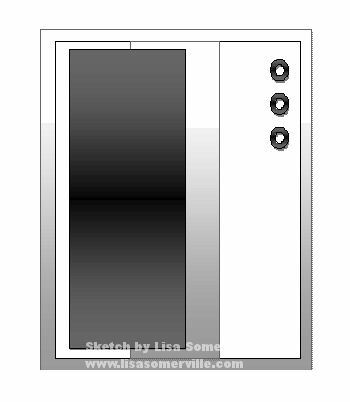 I am excited to see what you come up with for this sketch, don't forget to add you link below. So I am running late today. Left the house this morning to go to church and things just kept coming up all day. 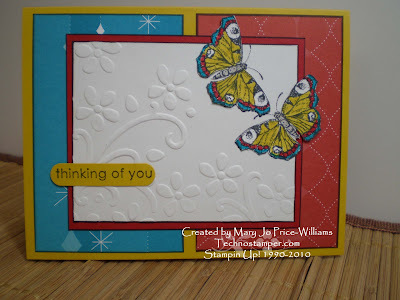 Haven't been able to even sit down, I didn't even post a Feature Stamper Challenge on Stampin Connection. Geez, they are gonna be mad at me. Well I got home and rushed to the basement to make a sample for this week's sketch. And now I get to pick the best of the best from last week. Please take a moment to visit the blogs of these ladies as their creations are wonderful and I am sure they would love to hear that, lol! Click on the picture to see the full images and be taken to the creator's blog. Great job on last week's sketch, don't go too far, I am posting this week in a few minutes. Hope you can play along!